What do you do with all those adorable school papers and awards your kids bring home? I’ve found that if I don’t have a plan for all that school memorabilia, it will take over my kitchen counters and create tons of clutter. How about you? That’s why creating a school memory box for each of my kids has been such a lifesaver (and a sanity saver) for me. I can’t tell you how awesome it is to have a central location to store all my kids art projects, certificates, school awards and all those wonderful examples of my children’s creativity through the years. School memory boxes are so much better than scrapbooks or binders because they allow you to store way more than just pictures. With a school memory box you can store bulky items like sports awards and ribbons and oversized art projects easily. Plus there’s no need to keep ordering or making scrapbooks (which cost a ton of money!). Make one school memory box and you’re done. 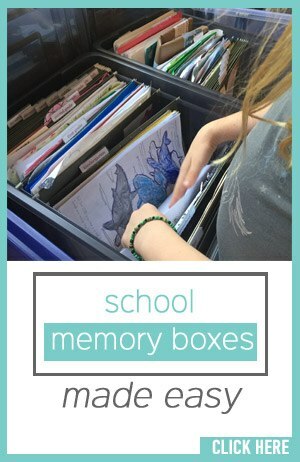 I’m just a little passionate about school memory boxes because they’re a genius way for busy moms to create a wonderful school keepsake for their kids (with very little effort and cost). Discover how easy and painless it can be to store your child’s school memorabilia with a school memory box! What is a School Memory Box? In its basic form, a school memory box is a container that stores a child’s school memorabilia. I’ve found that a plastic file folder bin is the sturdiest way to create a memory box. However, I’d highly recommend that you don’t just throw your child’s school memorabilia into this box. I use My Memory Box™ to keep my kids’ school papers and awards neat and organized. Do You Really Need a School Memory Box? Still not sure if creating a school memory box to organize your child’s school memories is something you should do? Or are you considering other school memorabilia storage methods (scrapbooking, school memory binders)? Trust me–I looked into all of those memory keeping methods for my kids school papers. And honestly, none of them worked. So I ignored organizing my children’s school memories for a long time… but it didn’t turn out so well (panic attacks, anyone?). Yep, after trying all the options, I created my own solution for saving kids school memorabilia and organizing kids school papers: The My Memory Box™ system. I made My Memory Box™ for me. 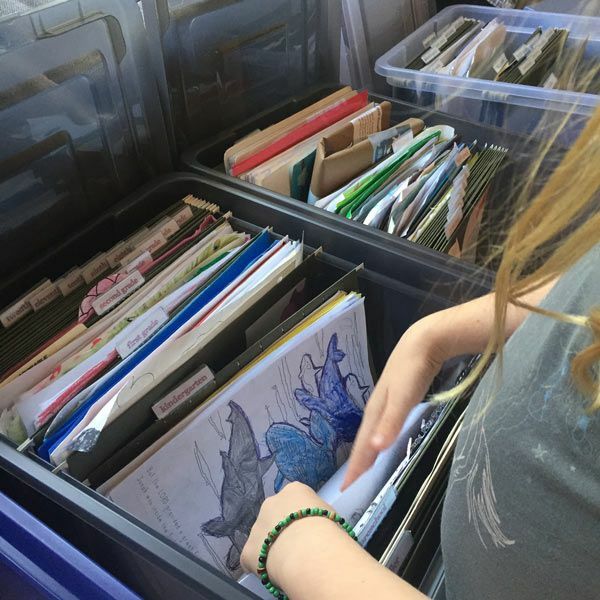 But then I discovered that so many other moms dealt with the issue of how in the world to store all their kids precious school memories (I guess I wasn’t the only one with anxiety about this!). And so, I made this system available to everyone and WOW…. the response has been tremendous! Hundreds of moms worldwide use My Memory Box™ to keep their kids school papers organized. 1. 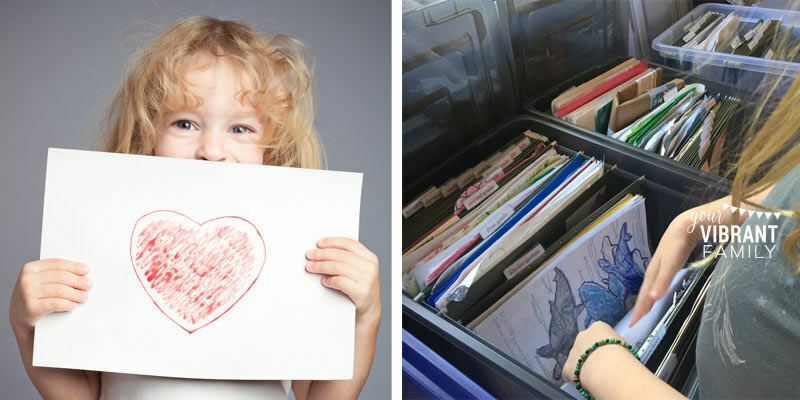 My Memory Box™ is the cheapest way to store kids school papers and awards. My Memory Box™ is $19.99 for the digital download (only one copy needed per family), and then $20-25/child to buy the plastic tubs, 15 file folders, etc. That’s it! 2. One singular location for all your child’s school memories, including awards and precious papers (not just photos). No need to have scrapbooks, binders or other memory keeping tools! My Memory Box offers an orderly system to store school memories year-by-year neatly (not just thrown in a box) all in one place. 3. 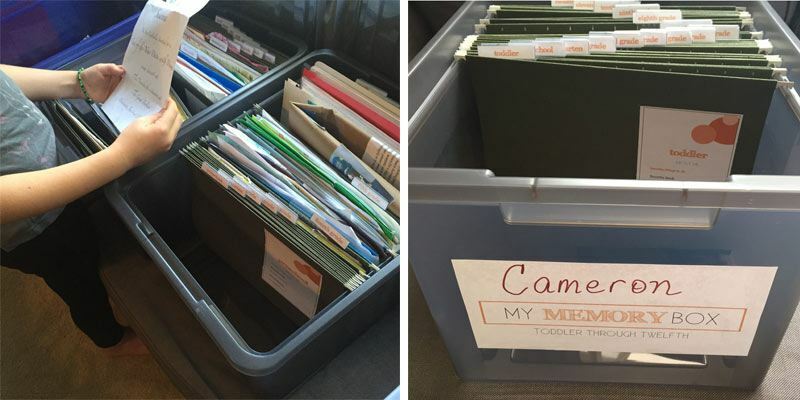 One box that neatly organizes school memories from toddler to teens. My Memory Box™ holds everything from toddler to twelfth grades school memorabilia. 4. 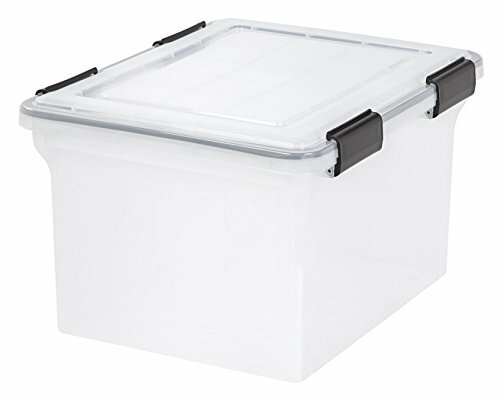 Compact for storage (as compared to one scrapbook or binder for each school year). Can you imagine how much physical space it takes to have a binder or scrapbook for each grade? Per child? That’s at least 15 books/binders, compared to My Memory Box™’s one plastic bin. 5. Odd-shaped or bulky school keepsakes store easily in the box. Scrapbooks or binders can’t hold those bulks items like ribbons, oversized art projects, etc. My Memory Box™ just makes more sense. 6. Easy way to store all those school papers and memorabilia as they come in (no more piles)—link to post. I love that I can organize all my kids school memorabilia as they make it. It doesn’t have to pile up all over the house anymore! We just put it right into each child’s My Memory Box™. 7. Memorabilia is easy to find for end-of-the-year parties or other times of reflection. Have you ever had to find specific school memorabilia from a certain school year for an awards banquet or graduation? With My Memory Box™ you know exactly where to go to find what you need. 9. Easily keep a record of the most precious aspects of your child’s growing up years. The My Memory Box™ file folder labels offer a creative, fun, easy way to keep track of things like your child’s signatures, lists of best friends, favorite books/activities at each stage. See the image below! 10. Kids can help put away the papers (and build their own school memory box bit-by-bit!). My kids now know that after they’ve hung uptheir precious art projects or award and are ready to put it away (or exchange it for a more recent one) they simply place their school papers or memorabilia in their My Memory Box™. 11. Great gift to give kids when they graduate from high school. I can’t wait for the day when I can hand each of my kids their My Memory Box™ as a wonderful, precious memento from their school years! And I especially love that this priceless school keepsake wasn’t something that I had to labor over. It was a simple school paper organization system that effortlessly built this wonderful treasure. You can see a full list of school memory box supplies here. Easy peasy, right? It only takes 10-15 minutes max to put a school memory box together with the My Memory Box™ system. P.S. If you’d prefer to see pictures and written instructions on how to put together a school memory box with the My Memory Box™ system, go here. What should I include in my child’s school keepsake box? That’s a great question! Honestly, I’d say keep whatever you feel is a great representation of your child at that stage. Everything my child makes is so cute! What tips do you have for moms like me who want to keep all my kids school papers? I know it’s hard, but I highly recommend that you’re selective about what school papers, artwork and other school memorabilia to include. I totally get it–it’s hard to toss some of those adorable creations! But if you already have a good sample of your child’s artwork (or sports memorabilia, or poetry, etc) from that stage, give yourself permission to toss the extra. What if my child is already past the toddler stage and we have tons of kids school memorabilia that need to be organized? No problem! Take it one step at a time. I’d recommend first dividing all your child’s school papers into several piles by grade. Then go through each pile, selecting only those school memorabilia items that are a good sample representation of your child during that season. After that you can start putting the papers in the My Memory Box™ files. If find something that’s not dated and you’re not sure where to put it, take a deep breath and just make your best guess. Try not to get too hung up on whether something is from first grade or second grade (that won’t be that big of a deal in the long run). I’m totally overwhelmed by my kids school papers. They’re everywhere! Where do I start? I completely understand. Trust me–I’ve felt that overwhelm too! First, set up your My Memory Box™ system. Next, follow the steps I outlined in the question above. Then, going forward, when your child brings home school papers or awards that you’d like to preserve, simply open the box and file the papers! You’ll have a great way to keep things organized (no more paper piles)!